Steps: What's That Scent You're Wearing...? What's That Scent You're Wearing...? Let’s look at the verse from Exodus first. That verse came from God’s instructions to Moses on how to build the Tabernacle. That was the place where God’s presence dwelled as Israel traveled. It was a holy place full of his anointing, and only certain people who’d been anointed with that specific oil could approach this tent. The oil for anointing was fragrant. It was a special perfume only used in that specific application. A distinct and beautiful scent worn only by those covered in it. And if Christ hadn’t sacrificed himself on the Cross, we’d still need a special anointing to approach him. Except he did sacrifice himself and then he left us his Holy Spirit. Every believer can receive the anointing of the Holy Spirit the moment we ask Christ into our lives. Here’s the best part, that anointing still comes with a fragrance unlike any other known to man. We don’t have to carry the stink of old sin with us. God covers it with his holy perfume. Don’t you love that he is into beauty? Even when it's what we smell like to others? Gone is the waft of something unpleasant, that smell we never could wash away. With one dose of his blood over us that stench is gone forever. We become pleasing to those around us. When we walk past they turn, catching on the breeze the scent of something attractive. Which is what that second verse is talking about. We are a fragrance of God to those next to us. An aroma that draws others to him. Oh, may we be one that is bathed in him! Nothing else. Lord, please let us wear your scent today. Help us to remember your beautiful fragrance is free and all-consuming. Allow us to not only inhale it today, but to bath in it so those around us will be enticed toward you. Today I challenge you to set aside the scent of old sins you may still be carrying and to roll in the aroma of God. If you wear a scent—lotion or perfume—as you spray it on let it be a physical reminder of all God has removed from you and his sweet love for you. 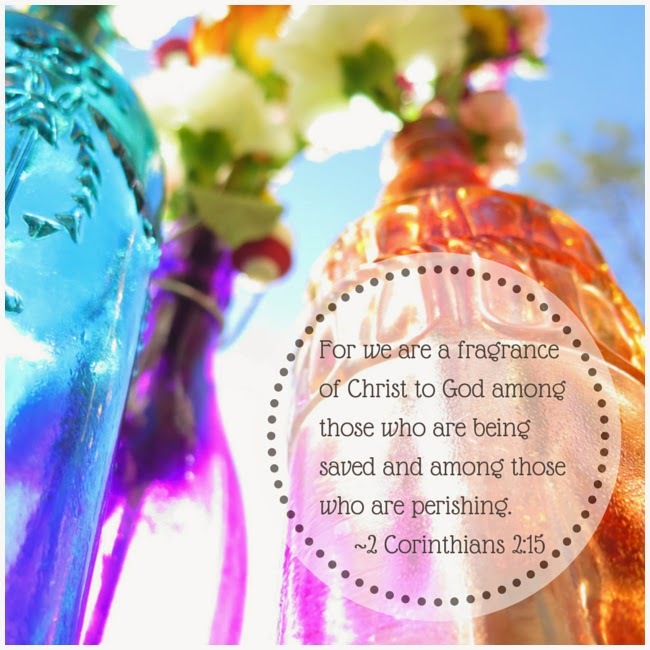 Allow that scent to become a daily reminder of his fragrance in your life.